One measure of Yayoi Kusama’s significance as an artist is the vast body of scholarship that has been generated around her work, particularly since its rediscovery by the international art world in 1989. This seems entirely appropriate, for Kusama's longevity as a practitioner and the scope of her oeuvre means that no single text could possibly do justice to the complexity and breadth of the artist's practice, which spans eight decades of active art-making. With this in mind, the essays featured here have been commissioned to contribute to this growing body of knowledge. They offer perspectives on specific aspects of Kusama’s practice and propose frameworks for considering her work in relation to historical tendencies, contemporary practice and today's global art world. Essays expand on some of the ideas provoked by the work in ‘Look Now, See Forever’. The first essay, by exhibition curator Reuben Keehan, considers Kusama’s work through a history of Minimalism. A consideration of Yayoi Kusama’s performances, ‘happenings’ and videos in relation to the work of an emerging generation of female artists has been written by the Gallery’s Assistant Curator of Contemporary Australian Art, Bree Richards, while an argument for the artist’s transcendence of such interpretative categories as nationality and gender has been contributed by Mami Kataoka, Chief Curator, Mori Art Museum, Tokyo. 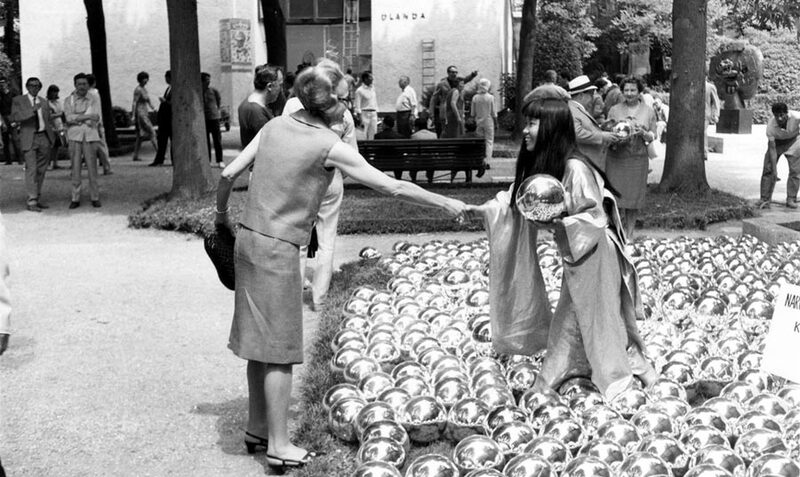 Yayoi Kusama with Narcissus Garden, Venice Biennale, 1966 / Image courtesy: Ota Fine Arts, Tokyo / © Yayoi Kusama, Yayoi Kusama Studio inc.